“I have never in my life witnessed Middle East Christians in such extreme danger,”Amine Gemayel warned on Wednesday. Speaking at a public lecture at Boston College, the former president of Lebanon called 2014 “a year of existential crisis” for Middle East Christians. He raised “the specter of genocide,” in the context of atrocities suffered by Christians and other religious minorities in the region at the hands of the Islamic State and other extremists. “If present negative trends continue to intensify,” Gemayel said, “we must start thinking about the unthinkable: the extinction of Christianity” in the region. 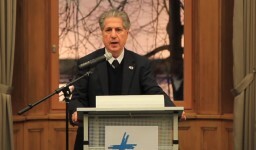 Gemayel noted Washington’s failure last summer to use airstrikes to halt the Islamic State’s mass religious cleansing of Iraqi Christians and Yezidis while using these means to defend other interests, such as oil installations. He furthermore appealed to the United States to intensify its support for Lebanon in its fight against the Islamic State and in its care for Syrian refugees. Gemayel’s talk was cosponsored by Christian Solidarity International and Boston College’s School of Theology and Ministry, Department of Slavic and Eastern Languages and Literatures, Department of Political Science, and Boisi Center for Religion and American Public Life. This Friday, March 27, the UN Security Council will be addressing the existential threat to Middle Eastminorities raised by President Gemayel.